TK Self Sufficient Set of solutions for grid-connected and off-grid structures, such as residential, retail and more. Set of solutions for grid-connected and off-grid structures, such as residential, retail and more. Providing efficient energy solutions using a wide range of dedicated power sources to reach substantial autonomy. Autonomous water supply throughout its entire lifecycle, including collection, pre-use filtration, potabilization, and post-use treatment. Recycling and optimizing indoor air flows. Managing waste through localized heat, sanitization, and dehydration solutions. A smart construction integrating all services and technologies. Piloting, monitoring, and optimizing environmental efficiency and coordination for housing units as well as for local villages. 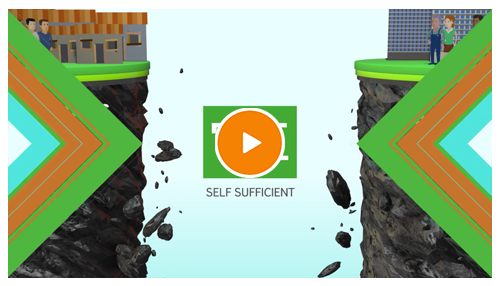 With 35+ years of experience with innovative technologies, knowledge protection, and valorization around the world, TK Self Sufficient is a white label platform, bringing access, via technology licensing, to fully packaged solutions for a variety of Self-Sufficiency markets. Managing a building/housing unit based on its predicted performance over its entire lifecycle - inception through operation. Retailers supported by a package of technical tools and dedicated services for surface management. According to environment norms and needs, TK Self Sufficient provides customized solutions to specific commitments. Powering: Providing energy supply for off-grid/on-grid autonomy solutions matching environmental constraints and maximizing the use of renewable energies. Purifying: Air and water supply are treated before and after cycles of use in all conditions. Monitoring: Smart grid solutions connected according to usage and environment. Analytics: Tracking, analyzing, and merging data through several ways. Building & Structure: An eco-designed shell to embed all technologies into a coherent and self-sufficient housing unit. Designed for up to 4 people. A unit of approximately 70 m2. Best-Class autonomy performance through a connected (on-grid) or disconnected (off-grid) energy supply network. Can make up a village of up to 50-70 residential units (up to 300 people) grouped, connected, and managed together, with shared utilities. Total primary energy consumption including heating, ventilation, airflow management, lighting, hot water production, auxiliary equipments, and electrical systems. Insulation through absence of thermal bridges, aeration, and insulation coefficient. Providing energy for structures according to target application sizes, objectives, and energy source capacities. TK Self Sufficient provides improved interfaces and support tools to efficiently operate a local grid with a number of variables to manage. With TK Self Sufficient’s real-time management platform, customization and adaption of the housing units to specific markets provide the best possible products and service-based solutions. Through key partnerships across various channels, TK Self Sufficient can quickly answer the needs of the client while focusing on production and product management. Supplying a frame that incorporates thermal, mechanical, and environmental characteristics according to the targeted territory’s needs. Adapting commodity definitions, such as energy and water, to local capacities and consumption use. Supporting utility use and efficiency by tracking and monitoring solutions in a dedicated environment. TK Self Sufficient’ services are available via several types of licensing agreements. These are all nonexclusive and tailored to the needs of the many different markets in which they are deployed. TK Self Sufficient is paid a license fee to embed, use, and customize software to meet the needs of the Licensee and reserve access to the system. A fee-for-service in the form of a royalty is paid to TK Self Sufficient based on the effective deployment of services. The TK-Self Sufficient system is customizable to meet the demands of all users, large or small, residential, commercial, or industrial, in all fields from real estate to retail, without sacrificing security. TK Self Sufficient has the ability to immediately ramp up production of its hardware or software to meet large demands, while guaranteeing product quality, smooth logistics, and the security of the clients. If you have any questions about TK Self Sufficient, please contact us using the form below and we will get back to you as soon as possible. Copyright © 2018 TK Self Sufficient Inc. Michel Salomon. All Rights Reserved.